When we imagine a future for humanity outside the planet Earth, we usually think of other planets, and first of all Mars. But there is another option, the fabrication of habitats for the human species, either in orbit around the Earth or around other celestial objects. For the moment, it’s still science fiction but the subject has been studied many times by very serious people. The idea of ​​a human colony floating in the void of space came first to Konstantin Tsiolkovsky. In 1903, he realized that a rotating cylinder could be used to simulate earth’s gravity by means of centrifugal forces. Very quickly at the beginning of the 20th century, concepts multiply as we discover and understand the conditions of the space environment. Solutions are imagined to allow the human being to live there. For example, Wernher von Braun imagines a 76-meter wheel in low orbit. 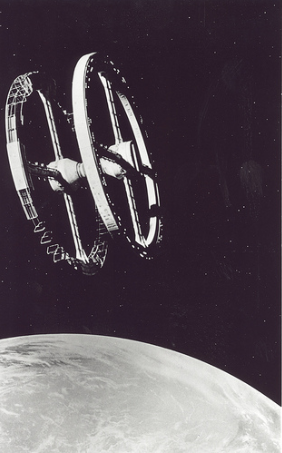 In 1952, this idea of ​​wheel-shaped space habitat is popularized with Stanley Kubrick’s film, “2001 A Space Odyssey”. From the 1960s, spaceflight became reality. The great powers launch the first space stations to study the prolonged stay of humans in space. With the first results, the spatial habitat models are finalized. In the 1970s NASA began to seriously study the subject. The US Space Administration commissions feasibility studies from a few physicists, including Dr. Gerard K. O’Neill. He will spend much of his career in the US Space Agency working on these issues. 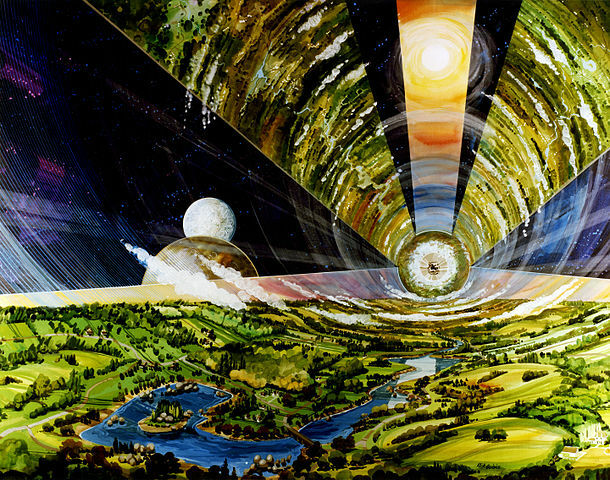 O’Neill’s first design for NASA is called “Island One”, a hollow sphere. The idea is to contain the population on the inner faces of the sphere. This particular shape has the advantage of optimizing the air pressure and providing effective protection against radiation. O’Neill calculates that a sphere of only 500 meters in diameter could shelter a population of ten thousand people. By rotating it at the level of its equatorial region, one would have a gravity equivalent to that of the Earth. Mirrors would be responsible for bringing sunlight into the sphere. A little later, O’Neill imagines another sphere of 1800 meters in diameter, “Island Two” capable of hosting an agricultural and industrial activity. The idea is to give some independence to its inhabitants with its own means of production. With the concept of “Island Three” space city, O’Neill opts for a cylindrical shape of 8 kilometers in diameter and 32 kilometers long. The habitat would theoretically be large enough to have its own weather phenomena. 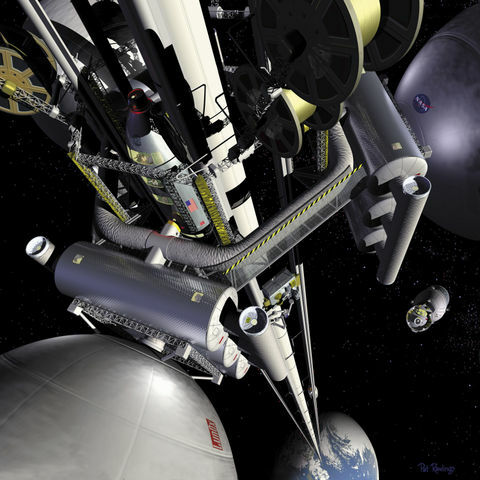 The construction of a large-scale space habitat encounters very important obstacles, the biggest of which is probably the cost of access to space. Even if all SpaceX projects were realized, it would take almost 70,000 launches of BFR to orbit the materials needed to build a 10-million-tonne housing capacity capable of accommodating 10,000 people, which equates to 7 BFR per capita. 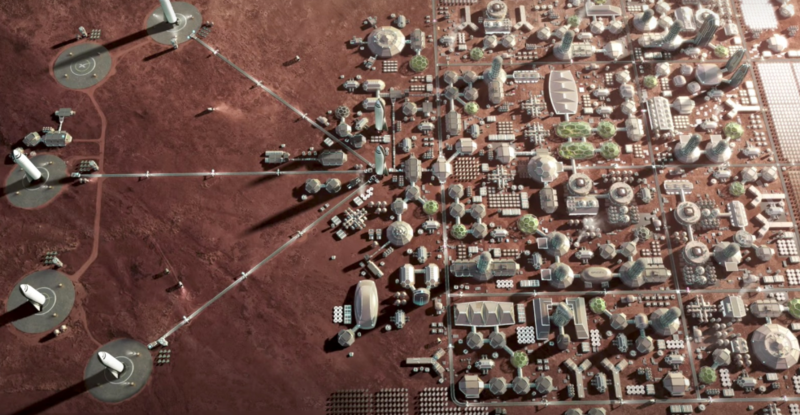 With its hundred colonists by BFR, the Martian colony proposed by Elon Musk seems much more realistic. Moreover, by choosing not to colonize a planet, one is forced to bring everything with oneself. The colonization of a planet also provides the guarantee of gravity, atmospheric pressure and some local resources. With a habitat that floats in space, you have to start from scratch. Although many space stations have already proved their worth, for the moment none of them has been able to demonstrate an artificial gravity by centrifugal force. A planet is also likely to offer a magnetic field and therefore a certain level of protection against cosmic radiation. The absence of atmosphere further means that there is no protection against falling micrometeorites. Finally, ideally a spatial habitat should be autonomous and thus provide an ecosystem capable of functioning. This involves creating and mastering an environment that is unfortunately unable to implement on planet Earth. If we can one day develop very large-scale construction methods in the space vacuum, then habitat-making becomes very attractive. The absence of gravity is certainly a constraint for human life but an asset for space travel. Without gravity, a space habitat becomes a far more fuel-efficient destination than a planetary colony. The possibility of building a space city in orbit or near the planet Earth multiplies this advantage. Earth life derives most of its energy from photosynthesis or the consumption of photosynthetic organisms. A space habitat placed in orbit around the sun could choose its sunshine conditions. 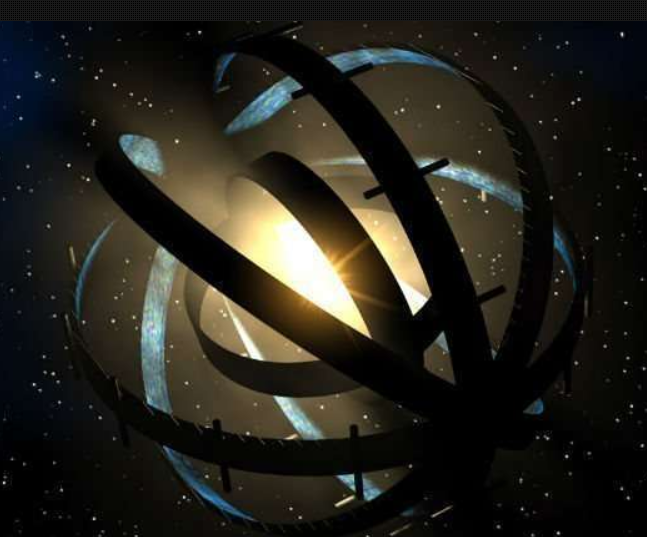 In its more extreme versions like the Dyson sphere, a space habitat would collect all of the light emitted by a star. A single solar system even without habitable planets could accommodate several trillions of individuals. 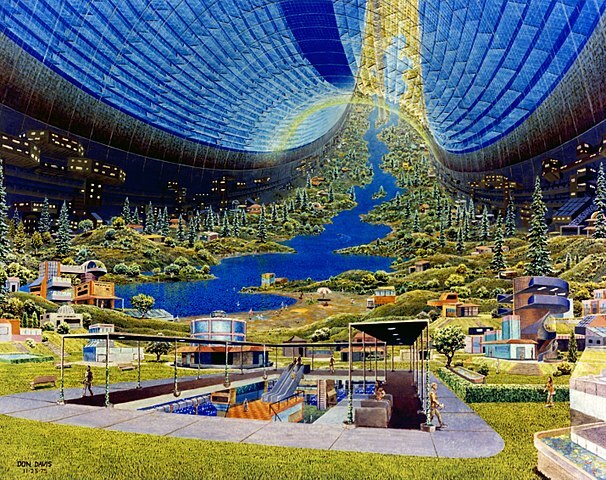 Finally, a permanent spatial habitat could be a support for planetary colonization. If the human species one day wants to become an interstellar civilization, it does not have much choice : either it discovers a way to travel to a not inconsiderable fraction of the speed of light, or it accepts that the trip will take more than a generation. In the latter case, the only option would be to build gigantic habitats capable of housing a human sample large enough to avoid consanguinity. This habitat would be responsible for traveling for hundreds or thousands of years. In the future a little closer, we can reasonably assume that we will not go from the international space station to a giant colony in Earth orbit. However, we start to look at the intermediate steps. For example, the private company Bigelow Aerospace creates inflatable modules. 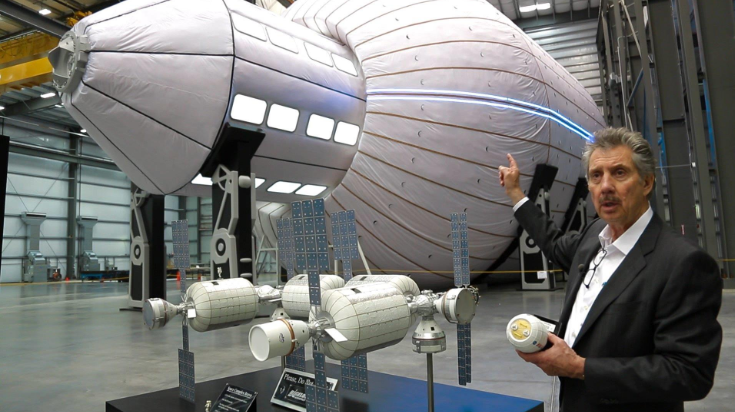 Bigelow hopes to be able to put large volumes of inflatable modules in orbit. The largest of these space habitats is called the BA 2100, simply because it offers 2100 cubic meters of pressurized volume. By comparison, the international space station as a whole offers 9131 cubic meters of pressurized volume. To compare with a BFR, it should be able to put into orbit two BA 2100. With 75 tons per module and 4200 cubic meters of pressurized volume per launch, it starts to become interesting, it provides some comfort to human activities in orbit. Whether for science or for space tourism, the construction of megastructures in space could be facilitated by exploiting resources from low-gravity celestial bodies such as the moon or asteroids. This is the solution that O’Neill envisioned. We can then think that the colonization of some stars of the solar system, including the Moon and the planet Mars, could serve as a springboard for the colonization of space. But as long as the cost of access to the orbit does not decrease drastically, that remains theory. The aggressive prices of SpaceX are very important because it forces the whole sector to find solutions to reduce the cost of access to space. If it is unlikely that we will quickly see a giant cylinder housing tens of thousands of humans, we can at least hope that the first wheel imagined more than a hundred years ago will relieve the space sickness of future astronauts.